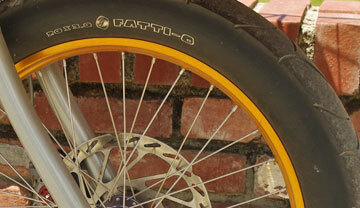 Fatti-o tires are much less likely to flat than a narrow racing tire. If you’re riding to work and don’t want to have a flat, you can take precautions by using the appropriate tire and tube, along with other inserts. A bus driver (I met one), for example, who can’t be late for work, would be wise to have tires that won’t go flat. Companies making “solid” no-flat tires come and go, but sealants have been around for many decades. Other precautions you can take include heavy tubes, Kevlar tires, and plastic liners. As a commuter, you better learn how to fix a flat, because it’s inevitable. Most cyclists don’t know how to fix a flat. Even when you can fix a flat, it’s a chore for bikes without a quick release, three-speeds, and bikes with fenders: All the more reason to use solid tires, if you’re a commuter who wants hassle-free riding. Most flats happen on the rear tire, because debris kicked up by the front tire winds up under the rear tire. I do not subscribe to wire scrapers that glide over the tire and supposedly catch debris before it can embed itself. If you do flat and you have absolutely no other option, you can ride. I’ve ridden a flat tire up to four miles with no serious damage to rim or tire. Your results may vary. This entry was posted on June 10, 2010 at 2:57 am and is filed under Commute Excuses. You can follow any responses to this entry through the RSS 2.0 feed. You can leave a response, or trackback from your own site.